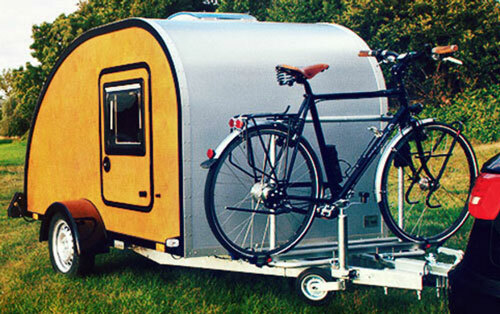 Kulba is a simple, compact camper intended as an upgrade from the traditional tent. Despite its really tiny shell the interior is spacious enough to provide a comfortable space for sleeping (140 x 200cm/4’7” x 6’7”). The 3-piece mattress can be quickly converted into sofa – and the cabin into place where you can also relax, spend time on reading or playing your favorite games, especially, during bad weather conditions. For easy access, doors with windows are located on both sides of the cabin. Both windows can be opened and are protected by mosquito net and sun-reflecting blinds. An extra skylight “optically” widens the cabin by bringing-in more outside world and sunlight. But for sure - due to small dimensions, by no means it can be considered as a lounge area! 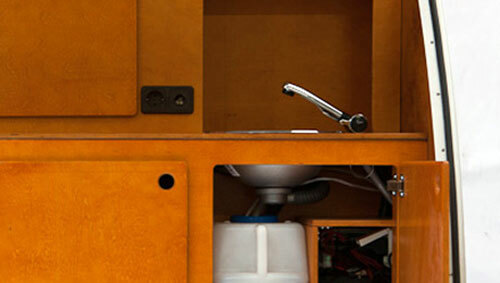 The kitchenette is located at the back of the camper under the lid. It’s small, but includes all you may need to easily prepare your camping meals including lunch and dinner. Gas or electrical cook-top, cooler, sink with tap and water tanks, cabinets for storage and electrical receptacles. The water is supplied by an electric pump from the portable tank located below the sink. The front area (tongue) can be used for installation of bike rack (the factory-one can hold two bikes) or a spacious cargo-box providing an extra storage space. The external power outlet allows for connection to the shore power system. 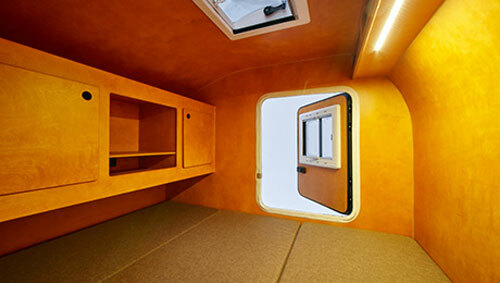 It will supply energy to interior receptacles (cabin and galley) as well as to charge the trailer’s battery. The side awning is a great option as it increases the “living space” almost three times. With maximum headroom of 200 cm it also allows for free movement! Among popular options there is also a roof-mounted rack for extra stuff, but may be more interesting is to capability to carry a kayak (most likely a very useful option in wilderness). Finally, proving the fact that the Kulba travel trailer is designed for short, weekend adventures into wilderness (or in general to meet the Mother Nature), the company offers also an off-road version of the camper. Kulba is not a mass-produced RV coming out in thousands off the production lines. Contrary – it is almost handcrafted one at the time according to reasonable customer’s wishes. Following this policy, the customer may also choose the color of side-panels or even opt for any specific image or pattern painted on them. 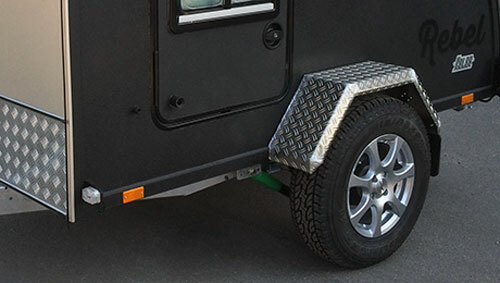 Due to its small size, lite-weight and great maneuverability, the Kulba camper can be towed by any car including smallest one and can be parked and stored anywhere. 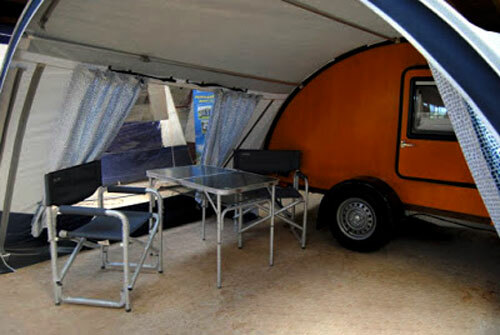 It offers level of comfort and camping style incomparable with tent, while at the same time it is economic, fuel efficient and affordable for many. 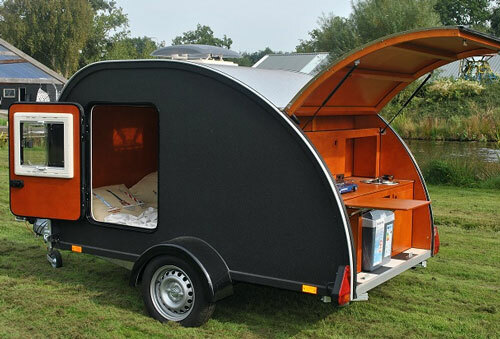 The Kulba teardrop travel trailer is made in Latvia (but it is E-marked, EU-certified and distributed across the Western Europe). But from the country of origin it brings the smell and feel of the Baltic birch forests – wood known for its strength, stability, quality and beautiful grain & texture which in camper’s “Woody” finishing is clearly visible under the layer of epoxy protection.. Note: The set of standard features varies depending on dealer’s offer.